Greetings! Aloha! I'm so glad you're here. It has been quite busy around here lately, and with a new babe on the way, I can only imagine that life will be more hectic. I'm 29 weeks pregnant already! Wow, the time flies. Speaking of time flying...my middle child turns 5 in a few days...a whole handful! So, this weekend we have a good old fashioned birthday bbq party planned. Her only real request was to have friends, and a pinata :) Hopefully the thunderstorms will hold off and we'll have a great party day complete with games, good eats and presents, topped off with cake and ice cream. My question for this week: What is your favorite birthday party memory? Did you ever have a fantastic party? Finally get that pony you'd begged for? Go somewhere super fun? Do share! Thank you for stopping by and taking the time to comment! Sorry about turning on the CAPTCHA, but I have a run of spam lately and my email way hijacked from France. BTW, if you use google do go through your account profile and check what info is stored on you account...they keep a dossier on you! Delete it, and DO change your password every 6 months. Aloha! 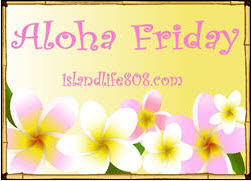 PS...don't forget to visit Kailani at An Island Life for more Aloha Friday fun. I always had birthdays at home. I used to envy those who got Chuck E Cheese or roller skating parties. But looking back, some of them were pretty fun; one in particular I remember having a balloon fight with my friends and popping them after with forks. My best birthday memory was when I had a party at a miniature golf place! I remember my mom making me this chocolate cake that was so good! I can't even think of anything - how sad is that??? Well, my hubby took me to Ruth's Chris for my 30th birthday, and that was nice. But I can't remember a fantastic childhood birthday! 29 weeks already- wow! 5 years old - wow! So many blessings in your family. My birthday party memory is of grades 3-8 when it seemed every year my parents would drive a huge bunch of my friends and I to a movie and then come to my house for a sleepover, at which we got no sleep. They were so much fun! Yesterday was my oldest's birthday and she turned 17! The only birthday party that I remember is when we invited all the neighborhood kids to Farrells. I remember having The Zoo and the waiters running around the restaurant with it. It was fun!